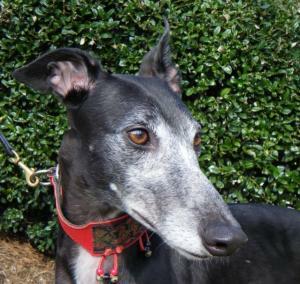 Apple is a tiny, black girl with a white face that raced at just 55lbs. She just retired from the Orlando race track. She lived in a foster home with a cat and a bird and has been around the tiniest of dogs and did fine with everything so far so seems to be a very low prey drive girl that can live with anything. She was born on September 7th of 2007 so is 4 years old. Her foster mom says she is sweet and friendly and always does the right thing and is so well behaved. She is quiet in her crate and clean in the house and even asks to go outside when she needs to go. She follows her foster mom around like a shadow and loves to be with her. She will stand forever with her head in your lap for petting and will choose to lay on cold tile next to you over a dog bed across the room. Her foster mom says that she will be a blessing to the lucky family that adopts her. Because she is a quiet girl she should be OK for apartment or townhouse living. Apple was renamed Rooney and lived with the Young family of Columbia until she passed away from Pancreatitis in December of 2017. She will be missed.